Remodeling – Carlson Exteriors Inc.
New Roof: Tear Off Or Layover Shingles? When looking to purchase a new roof for their home, many homeowners debate laying new shingles over the existing shingles or just start fresh by tearing off the old shingles. Usually homeowners think about laying over to save some money – but is it worth the saved bucks? Without tearing the shingles off and actually seeing the roof deck, one can only speculate the condition of the OSB. Obviously, if sections of your roof are rather soft to walk on the wood is bad and will need replaced. However, you can have smaller sections of wood rot and not know it until the shingles are torn off. Many shingle manufacturers have rather poor warranties for roofs that have been laid over. Best case scenario you will get a 10 year limited life warranty – it will be pro-rated. If the shingle fails within the first year after your roof lay over, you will have to pay some money out of pocket. The best thing about a Carlson Exteriors roof replacement is the roof warranty. Any roof we replace will get a 50 year, non prorated warranty that is transferrable one time. It actually increases with inflation so you don’t have to pay anything out of pocket! Woohoo! If your old shingles have warping or curled up edges, the new shingles that you lay over will take on the look of the old shingles. The new shingles may look wrinkly or bumpy. The new roof will look terrible from day one. If a new roof is laid over, it will have a shorter roof life. The shorter lifespan is due to a couple reasons. First, not nailing directly into the roof decking can lower your roof’s resistance to high winds. The nails might not be driven as deeply or as securely into the plywood as they should be. On the other hand, some nails may be overdriven thanks to the old shingles “cushion” . When nails are overdriven, it can pierce directly through the new shingle and not provide any security at all. 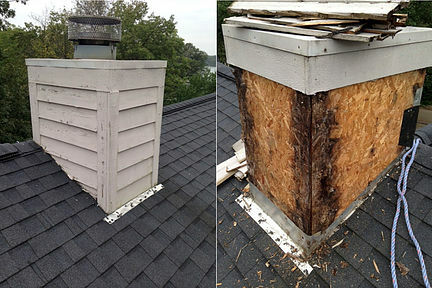 Some home insurances provide better rates if your shingles are nailed directly into the OSB. Secondly, the moisture trapped between the two layers of shingles will increase the speed of asphalt deterioration. The second layer of shingles will increase heat and moisture retention, especially if your roof is not ventilated properly. Carlson Exteriors always tears off the existing shingles for these reasons. The money that homeowners would “save” by not tearing off old shingles is not worth it. A layover roof can be deemed more expensive due to poorer roof warranty, possibility of more leaks, and the damage that could be done to home’s structure. In this case, the cons outweigh the pros. This blog is part of a series. Search our site for “behind the scenes” to read other articles in the series. CertainTeed is a nationwide known brand; and for good reason. They make great shingles and offer plenty of colors. But the reason Carlson Exteriors loves using CertainTeed is for the roofing warranty they provide to the homeowner. This warranty is registered in homeowner’s names. The original is mailed to homeowners, a copy is mailed to Carlson Exteriors, and CertainTeed keeps a virtual copy. Unlike most warranties, CertainTeed’s has no loop holes and no fine print. To read more in detail about our Unconditional Roofs – Click here. I was able to interview CertainTeed’s Territory Manager, Bob Eaton, to get his insider opinion. I’ve worked for CertainTeed for 15 years now. I truly enjoy seeing my customers and I believe that will never change. I believe providing a true 50 years Peace of Mind Full replacement warranty for all homeowners is essential. I’m the point person for all claims and when a shingle does fail, I want to make sure the homeowners gets taken care of in all aspects. The only way to do that is to have the SureStart Plus Warranty on their home. If you look at the chart below, the SureStart Plus warranty Bob is talking about, actually increases with inflation. The middle column is the usual warranty that most shingles come with. With the typical Limited Warranty, even in the first year the homeowner is still paying a decent chunk out of pocket. EVERY roof Carlson Exteriors installs, gets a SureStart Plus Warranty. I can’t ever remember CertainTeed not doing the right thing for the consumer. CertainTeed has always supported me in the field and that is critical to my success and to homeowner’s happiness. Carlson Exteriors is a great partner. I truly enjoy working with everyone. You’re extremely organized from top to bottom. From my stand point, you do it right the first time. PlyGem (Mother company of Mastic) has been the industry leader in vinyl siding for quite some time. Being a lead manufacturer usually means that the “small-company feel” gets lost. However, that is not the case with Mastic. They are personal and prompt – customer service, training, and warranty issues. This is the main reason Mastic is Carlson Exteriors’ preferred brand of vinyl siding. They are extremely personal and efficient when working with contractors customers. The few warranty claims we have had with Mastic, get remedied quickly and our homeowners aways walk away very happy. Mastic is not just a producer of products. What I think Collin means by this, is that Mastic is more than a siding factory. They care about the customer experience from start to finish. Mastic wants it to be enjoyable picking out colors and styles; that’s why they’ve invested so much into technology to help you see their products on your own house. Mastic wants the install to go without any hiccups; that’s why spend so much time training Mastic employees and contractors. Mastic knows their products are made to last and be durable; that’s why they never stop testing their products against the elements. Mastic wants you to love them even after you’ve bought from them; that’s why they resolve any siding problems very quickly with the least amount of cooks in the kitchen. I started working for Mastic when I was 14, mowing the yard at the plant in Princeville, IL. My father was a Corporate buyer for them and they always treated him very well. I get excited about Mastic’s evolution of products and colors! The day I started, we had 3 profiles and 6 colors. Today, we have 6 profiles and 35 colors. Mastic was Collin’s first job and has been Collin’s only job! He’s watched and helped them grow and is still looking towards Mastic’s future. Below is Newport Bay and Natural Slate, which are two of Mastic’s newest color releases. Mastic is not just a specialist that makes vinyl siding. We also make our own Metal, Rainware, I.M and Stone. This allows consumers to color coordinate and everything is covered under one manufacturer’s warranty. Our specialty is being an ally to contractors and their customers. We offer sales tools that include color and design programs to assist the consumer in product and color selection (even using their own home) along with comprehensive installation/training programs that certify the contractor with the latest installation techniques. Mastic happily takes a photo of your home, uploads it in their software, and lets you pick and chose what siding or shake products you want and where you want them. Here are some pictures that Mastic did for one of our customers last year. 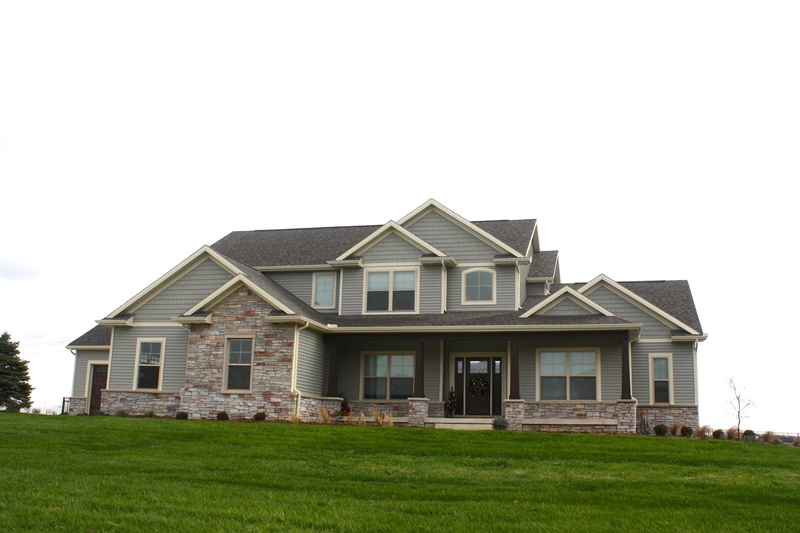 Mastic Software takes your home and transforms it so you can see different siding products on your home. This sheet breaks down the Mastic siding and shake products that were used on this home. We are set apart by product, people, and warranty. Product: We offer a good-better-best in many styles in over 35 design colors. We make our ownMetal, Rainware, and I.M products with color coordination across all product platforms. All covered by one manufacturer’s warranty. People: Easy access to our company. We don’t subcontract out to 3rd party customer service. Our people are trained and will come out to contractors to help with advertising and marketing, etc. We have local sales representatives. Mastic sends out a Semi-truck decked out with a showroom of all their products to many county fairs and home shows across the nation. Every year, you can find Carlson Exteriors by the Mastic Semi Truck at the McLean County Art Fair. I’ve been working very closely with Carlson Exteriors for over 7 years now. I’m trusted to go out and discuss warranty issues with Carlson’s customers. 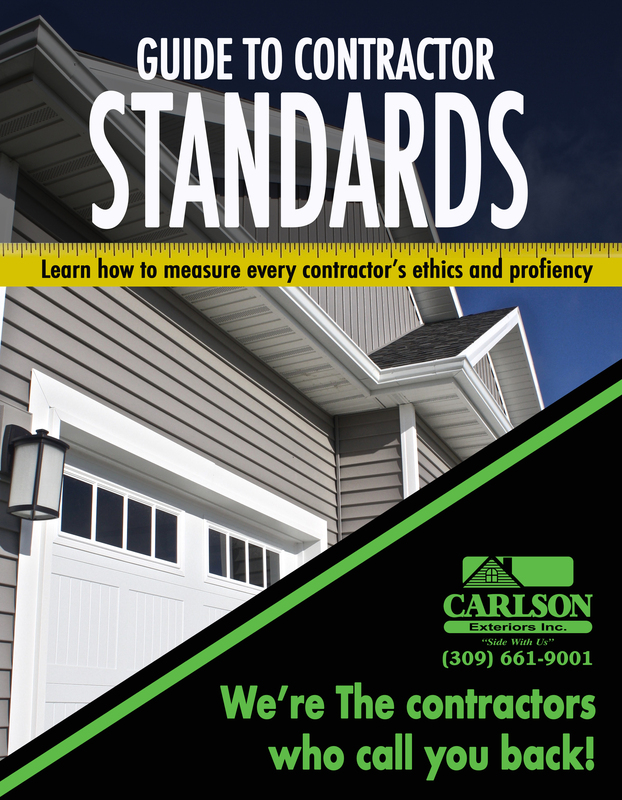 We keep Carlson Exteriors up to date on new products and programs. We also have visits from our marketing group to train Carlson’s sales people. If you are one of our customers and happened to have a warranty issue with your Mastic vinyl siding, you’ll get to meet Collin! He’s our biggest advocate when it comes to getting your siding fixed up. Does the product do what it claims to do- without fail! Are there warranty issues? If there are, how does the manufacturer handle it? Does the manufacturer provide adequate training for contractors? Is the product a safe bet for homeowners? Carlson Exteriors Inc. spends a long time debating and researching a product before we ever think about adding it to our exterior services. Our siding carries purpose. Our shingles have a backbone. Our gutters will never let you down. We always insist that every product performs perfectly – zero exceptions. It’s worth talking about – so we will! With our ‘Behind the Scenes’ blog series, we will go over products Carlson Exteriors has chosen to use and why. We will discuss our relationships with siding, roofing, gutters, and garage door companies, we’ll talk with manufacturers directly, and we’ll show you, the homeowner, how you fit into the grand equation. If you are interested in reading these articles, search “Behind the Scenes” on our website. It will show you all the articles that have been released. As the New Year rolls in, you are probably thinking of all the home improvement projects you want to tackle for 2017! If you have more projects than you have the motivation, time, or budget for which one should you start with? A covered porch or patio might be the perfect place to start. If done correctly, you’ll be asking yourself how you ever lived without a covered porch. The extra living space can become a great entertaining spot or a nice, relaxing space while adding value to your home. You can spruce up a covered porch with landscaping. Outdoor living areas are trending right now (for very good reasons!). Covered porches can be very elaborate and versatile by being a living area, dining space, and sometimes an extra kitchen! If you don’t want a full blown kitchen like this covered porch but want a cooking spot, consider building a brick oven, pizza oven, or fireplace. Since the space is sheltered from some environmental elements you can even decorate the space. These furnishings will last longer by being sheltered from most weather conditions. You can feel better about investing more money into decorations, rugs, and furniture if it will endure longer. You might find that adding a covered patio or porch will reduce your utility bills since it increases the amount of shade around your home. Depending on where you live, you might find that it’s a good idea to add ceiling fans or some outdoor heaters to help lengthen the span of usable weather. Lastly, putting in a quality covered porch will increase the value of your home. If you happen to live in a more competitive housing market or put your house up at a competitive time of year, the extra outdoor living space might give you the edge.